We've just released Risk and Reward, a new teaching unit about the beginning of venture capital and the rise of Silicon Valley as the tech center of the U.S. It focuses on the stories of Atari and Genentech and is great for teaching about business, economics, entrepreneurship, technology, and American history. 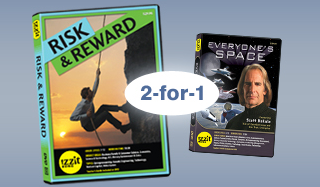 For a limited time we are offering our popular DVD about space entrepreneurship, Everyone's Space, as a free bonus for any teacher who orders Risk and Reward, as their free video selection. Visit www.izzit.org and order your DVDs today! Teacher of the Year Contest - One Week Remaining!